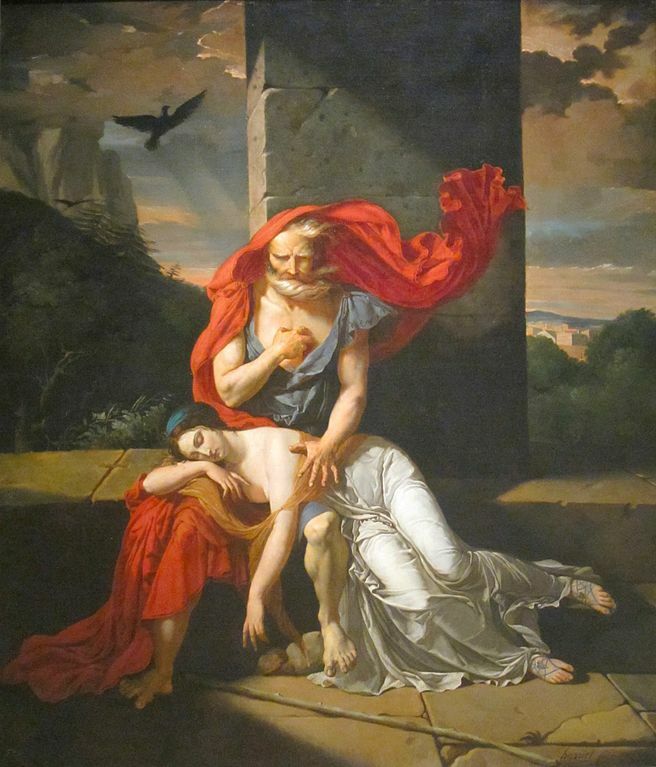 Oedipus at Colonus, by the artist Fulchran-Jean Harriet, is a painting of the tragic play of the same name by the Greek writer Sophocles. Divorce. Bankruptcy. The death of a loved one. Financial Ruin. Debilitating Injury. Foreclosure. Disaster. No one is immune to the inevitable fall(s) that we all experience over the course of our lives. One moment, you may be at the apparent peak of your life – wealthy, successful, celebrated; the next you may be brought to your knees, humbled and humiliated. Just ask Oedipus Rex. While the disasters that may befall one are often very real and painful, the meaning we attach to and take from them is what philosophers, artists and writers have focused upon down through the ages. The crises often involve tremendous loss, what Jung would term the metaphorical “death of the ego.” Greek tragedy, like Oedipus or Ixion, are replete with studies in the inevitable fall brought about by hubris and unchecked ego. Interestingly, Oedipus is saved only when he accepts his fate. Suffering is a part of life and, while we may not understand it, we are saved when we accept it and view it as a blessing.